Derby Arena - DerbyProfessor Brian Cox Live! 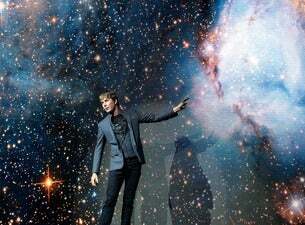 Manchester Arena - ManchesterProfessor Brian Cox Live 2019! The O2 - LondonProfessor Brian Cox Live! Arena Birmingham - BirminghamProfessor Brian Cox Live! Brian Cox, OBE, is Professor of Particle Physics at The University Of Manchester, The Royal Society Professor for Public Engagement in Science and a Fellow of the Royal Society. An ever-present personality on British television, he's well known for presenting programmes such as Horizon, Wonders of Life, Stargazing Live and Forces of Nature. Since 2009, Brian has also co-hosted the popular BBC Radio 4 show Infinite Monkey Cage with comedian Robin Ince. He has also appeared as a panellist on the comedy show QI. Having set two Guinness World Record titles with his previous sell-out live UK and Ireland tour, Brian is heading back out on the road with a brand new show in 2019 called Universal: Adventures In Space and Time. This tour promises to take audiences to the edge of our current understanding of the origin and evolution of our solar system and the universe. Universal will feature state-of-the-art graphics and imagery from ground-based telescopes, presented using ultra-high-resolution technology. On all dates of the tour, Brian will be joined by Robin Ince who will host a Q&A, giving fans the chance to ask their most burning questions.